Expedition: The Roleplaying Card Game from Fabricate may be of interest, and is available as a physical copy as well as a no-cost print and play version. We created Expedition so that anyone can enjoy roleplaying, whether this is your first RPG or you’re a D&D veteran. After years of playing traditional RPG games like Dungeons & Dragons and Pathfinder, we realized that roleplaying shouldn’t have to take forever. It shouldn’t need hundreds of pages of rules, and you shouldn’t need a math degree to create a character. Roleplaying should be about having fun together. If you agree, you’re going to love Expedition: The Roleplaying Card Game. 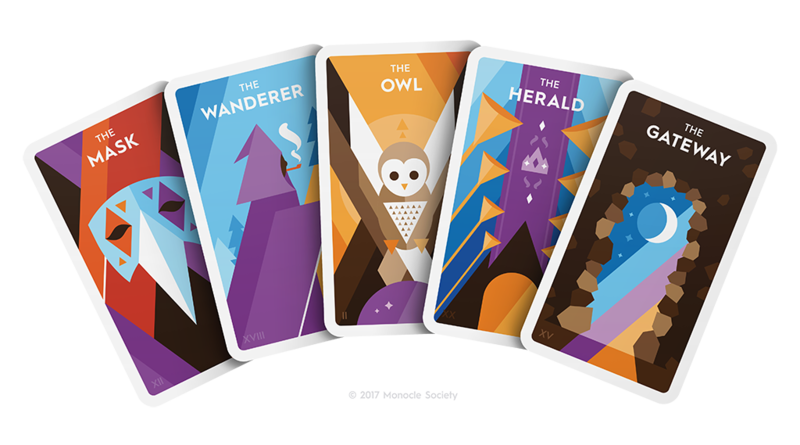 Weave is a storytelling, roleplaying game from Monocle Society with cards in a minimal style, inspired by Tarot, that may be of interest. Weave is a 21st century storytelling platform for everyone. With just two decks of cards and a handful of dice, you and your friends can create adventures in any genre, from sci-fi to high school comedy. When combined with the free companion app, Weave provides all the power you’ll need to discover new worlds, imagine amazing characters, and save your stories online in minutes.